LIVING WATER of Magnesia is a premier mineral drinking water. It is a liquid dietary supplement that is formulated to provide a complete range of macro & trace minerals that is lacking in our food and water. This full complex mineral is in an ionic form, making it a very unique and healthy mineral supplement. It provides true hydration. Using the purest water from reverse osmosis process and adding the best nature-harvested ocean mineral concentrate, LIVING WATER of Magnesia is beneficially unique - it is 100% absorbable. Ocean mineral is also unique because the ratio of mineral to each other is similar to our blood plasma. Low in sodium, yet high in magnesium, it is unrivalled as an electrolyte drink. 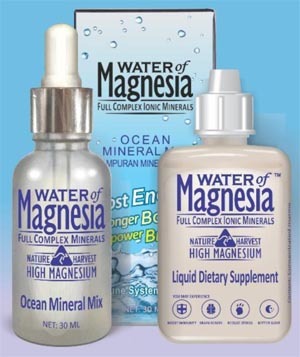 LIVING WATER of Magnesia is the TRUE supplement. Take the LIVING WATER for optimum health! Every 500ml bottle of LIVING WATER of Magnesia provides an amazing 50mg of ionic minerals for a healthier you! This amazing Trace Mineral supplement was developed to address the mineral deficit that is common in the modern diet. The low sodium, full spectrum concentrate is derived from pure ocean water rich in natural occurring minerals and nutrients. Magnesium is one of the six essential macro-minerals that comprise 99% of the body’s mineral content. Magnesium helps build bones, enables nerves to function, and is essential to the production of energy from food. Magnesium has been shown to have therapeutic value in treating conditions such as headaches, chronic pain, asthma, and sleep disorders. And in recent large scale study, magnesium has been linked to a reduced incidence of conditions such as heart disease, hypertension and diabetes. Magnesium is a mineral that's crucial to the body's function. Magnesium helps keep blood pressure normal, bones strong, and the heart rhythm steady. Experts say that many people in the U.S. aren't eating enough foods with magnesium. Adults who consume less than the recommended amount of magnesium are more likely to have elevated inflammation markers. Inflammation, in turn, has been associated with major health conditions such as heart disease, diabetes, and certain cancers. Also, low magnesium appears to be a risk factor for osteoporosis. There's some evidence that eating foods high in magnesium and other minerals can help prevent high blood pressure in people with prehypertension. Read more: Why do people take magnesium?